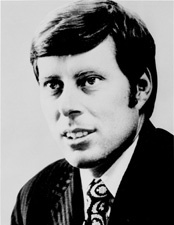 TUNNEY, John Varick, a Representative and a Senator from California; born in New York City, June 26, 1934; graduated from Yale University 1956; attended the Academy of International Law at The Hague, Netherlands, in 1957; graduated from the law school of the University of Virginia at Charlottesville in 1959; admitted to the Virginia and New York bars in 1959 and commenced practice in New York City; joined the United States Air Force as a judge advocate and served until discharged as a captain in April 1963; taught business law at the University of California at Riverside in 1961 and 1962; admitted to practice law in California in 1963; special adviser to the Presidents Committee on Juvenile Delinquency and Youth Crime 1963-1968; elected as a Democrat to the Eighty-ninth Congress; reelected to the two succeeding Congresses and served from January 3, 1965, until his resignation January 2, 1971; was not a candidate for reelection, but was elected in 1970 to the United States Senate for the six-year term commencing January 3, 1971; subsequently appointed by the Governor, January 2, 1971, to fill the vacancy caused by the resignation of George Murphy for the term ending January 3, 1971; served from January 2, 1971, until his resignation January 1, 1977; unsuccessful candidate for reelection in 1976; resumed the practice of law in Los Angeles; was a resident of Beverly Hills, Calif., until his death on January 12, 2018. Tunney, John. The Changing Dream. Garden City, N.Y.: Doubleday, 1975.